Amidst the rising cooperation between Israel and China, Israel’s leading disabilities organization, Beit Issie Shapiro, has partnered with a Chinese entrepreneur to provide expertise and Israeli know-how in the field of disabilities. “There is growing concern for people with disabilities in our country” said Wenqing Zhu, CEO Suzhou Yuanmeng Accessibility Technology Co. Ltd. “Institutions from the U.S. and Europe have visited China to exchange knowledge about the issue, yet there has been no concrete solution. Based on my extensive research and analysis, I believe there is tremendous room for cooperation with Beit Issie Shapiro, and look forward to improving and growing together as a team”. 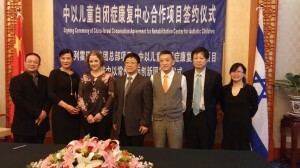 At a ceremony in Beijing on January 29, Beit Issie Shapiro signed an agreement with Zhu’s firm to establish a pilot Autism Rehabilitation Center in the China-Israel Changzhou Innovation Park in Changzhou City of the Jiangsu Province. In attendance were key Chinese government officials and an Israeli representative from the Chief Scientist Office. With an initial investment of 15 million RMB by Zhu’s firm, the long-term plan is to roll out centers across China with a total investment of 120million RMB. “We commend Mr. Zhu on his inspiring social vision of a better quality of life for children with disabilities – a vision we strongly share. We look forward to assisting him with making this a reality in China,” said Sharon Yeheskel-Oron, Beit Issie Shapiro’s International Collaborations Officer. The signing ceremony took place following a conference hosted by Liu Yandong, the Vice Premier of the People’s Republic of China with Israel senior government officials including Israeli Foreign Minister, Avigdor Lieberman. “Our partnership is the symbol of building successful trade between the two countries. This project in the field of disabilities will be one of the role models for this kind of increasing cooperation” Zhu continued. Andrea Yip, China-Israel Cooperation Investment Consultant – who moved to Israel five years ago from Hong Kong – brought Mr Zhu to Israel and facilitated the relationship with Beit Issie Shapiro. Beit Issie Shapiro plays a pioneering role in the development and provision of cutting-edge innovative services, changing attitudes in society, advocating for better legislation, and sharing knowledge throughout Israel, as well as internationally, through research, consultation and training. Beit Issie Shapiro has Special Consultative Status with the UN’s Economic and Social Council (ECOSOC) since 2012 and was recently granted association with the UN’s Department of Public Information.